I’ve noticed that my coffee doesn’t taste as good as it did when my coffee maker was brand new. Do I really need to buy a new one? How do I get the same flavorful coffee I used to get? Can I clean it? Americans drink an average of three cups of coffee per day, making it a vital part of our daily routine. When making that perfect cup of coffee at home, you always use the tastiest coffee beans, the purest filtered water, and your very favorite coffee mug, but are you really doing everything you can to ensure the best tasting cup of coffee possible? It might surprise you to learn that a 2011 NSF study found the kitchen to be the germiest place in the home, with more germs hiding in coffee maker reservoirs than on bathroom faucet handles, light switches, and even pet toys! 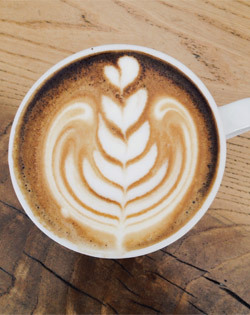 Not only can improperly cleaned coffee makers harbor yeast and mold that might make you sick, but oily residues, hard-water deposits, and other impurities can build up over time to spoil your best efforts at a delicious cup o’ joe. By adding just a few simple steps to your coffee making routine, you can ensure that your daily cup of coffee gives you that extra pep in your step without any harmful germs or unpleasant tastes. After you’ve finished with your coffee, dump any remaining liquid out and clean the carafe with liquid coffee pot cleaner or soap and water. Not only can stuck-on coffee stain your carafe, but it can also leave behind residues that may affect the taste of your next brew. Remove your coffee maker’s filter. If your coffee maker uses a permanent filter, dump out the grinds and wash it. If you coffee maker uses disposable filters, simply remove the filter and throw it away. You should remove the filter holder on a regular basis and rinse it off, as coffee grinds have a tendency to settle there. Wipe your coffee maker down with a wet rag. Pay special attention to the hot plate when it has cooled, as this area tends to accumulate coffee drips that can build up over time and lead to an unpleasant burning coffee smell. Depending on how hard your water is, your coffee maker should be decalcified every 1-3 months using a decalcifying agent or white vinegar and water in order to remove any mineral build-up. When using a white vinegar and water solution, fill the coffee maker’s water chamber with equal parts white vinegar and water, then start a brew cycle. Turn off the coffee maker midway through the cycle and let it sit for an hour. After an hour, resume the brew cycle. Pour out the vinegar and water solution and then run a new brew cycle using only water. Repeat this water-only cycle two more times to fully rinse out your coffee maker, giving your coffee maker time to cool slightly in between brews. Coffee & Tea Clean, Coffee Maker, How-To. permalink.